Are the Poconos too cliche for an anniversary getaway? I mean, we've all heard the stories (gasp - from our parents!) about champagne glass hot tubs and mirrored walls and ceilings. That's what I knew of the Poconos. So, for our 10th Anniversary, looking for a little getaway, Mr. Hot and I decided to take the advice of a good friend, long in the hospitality industry, and stay in Hawley, PA, at the Ledges Hotel, even though, it falls under the auspices of the "Poconos." I trust this friend, and for good reason, she introduced us to the "other Poconos." 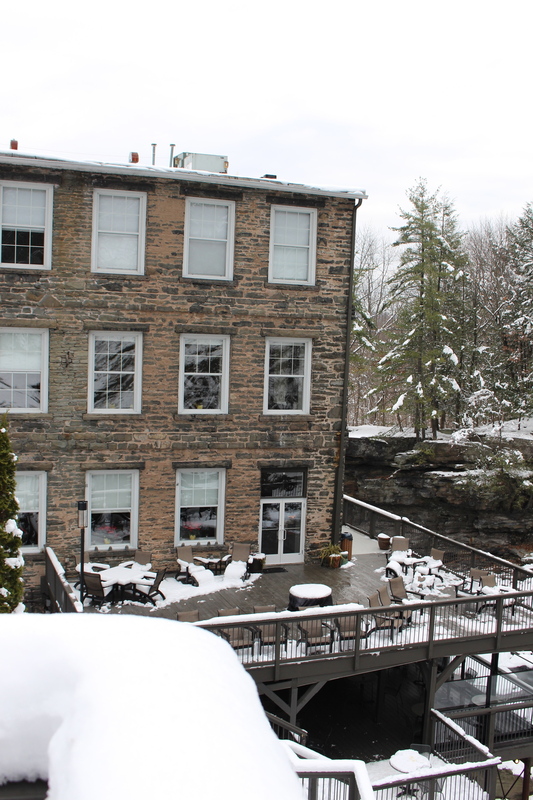 Nestled in a cascade of natural rock ledges among the Paupack High Falls, the appropriately named eco-friendly, boutique hotel, is a luxury historic hotel with modern slant. The twenty-odd room hotel is housed in a Federal style building that dates back to 1890 when it served as home to the John S. O’Connor Glass Factory. A valid reason to leave the tub is to visit Glass Wine Bar. Located downstairs, and open to viewing decks, Glass offers modern small plates, and an "All American" beer and wine list. Mr. Hot and I enjoyed the local deviled eggs with smoked trout, and a smoked gouda and chorizo dip with house made tortilla chips. Aesthetically, the blend of materials and textures at Glass is simultaneously modern and rustic. If you look around, you'll notice original glass from the O’Connor Glass Factory and original glass mold prints and displays. Ledges is a sister property to the award winning Settlers Inn, located about 1 mile from the hotel. Settlers proved to be the perfect place for a special dinner. From the fireplace in the foyer room to the piano player in the dining room, Settlers offers that special experience. After complimentary champagne, Mr. Hot began with Baked Onion Soup, Leraysville Amish Baby Swiss ($7.50), and I opted for the ultra-indulgent Butter Poached Lobster Claw on Crispy Polenta ($15) with crisp basil, Romesco sauce and saffron aioli. My entree, Grilled Petite Filet Mignons ($37), Blood Orange Béarnaise and Crab Risotto Broccolini was outshone by Mr. Hot's heavenly braised veal shank ($34) with garlic and rosemary jus. For dessert we shared Beggars Purse dessert while the pianist played the Casablanca signature, "As Time Goes By." It was perfect. The next morning required a bit of liquid oomph. Settlers Inn had just the tonic - a chock full Bloody Mary, in addition to a farm fresh omelet. Then, the getaway was complete.